The Worlds of Giordano Bruno explores the fantastic journeys made by the 16th century Italian philosopher, astronomer, monk and heretic. The Worlds of Giordano Bruno explores the fantastic journey made by the 16th century Italian writer – philosopher, playwright, astronomer, poet, monk and heretic. His journey continued in the symbolic uses made of him by the patriots and fathers of modern Italy. "The Man Galileo Plagiarized" is not a new claim, but from Johannes Kepler writing to Galileo of his unacknowledged debt. Giordano Bruno has for too long been overlooked as a ‘modern man’; his prescient observations of the universe certainly stimulated Galileo. Bruno meandered in his long travels throughout 16th century Europe. Like a pinball, he shot up from southern Italy, bounced around France, England and Germany, then dropped back down to Italy. 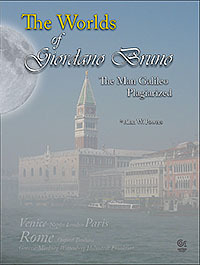 The Worlds of Giordano Bruno explores these travels, his encounters with various monarchs and academics, some of whom he disparaged. Powers translates passages from most of Bruno’s works to display his unmistakable voice – lively, humorous and poetic. 116pp, full-colour, printed on quality art paper.